Franz Joseph Haydn was the father of the classical symphony. Most people know how prolific a composer Mozart was. Haydn may have been more prolific with his amazing composition of 104 symphonies. Haydn had an advantage, as he lived an unusual long time [77 years] for that era. Like Bach in the Baroque era of music, Haydn, in the classical era was an invaluable contributor to the development of all music. Not only did he lead the way with the classical symphony, he also was an early developer of the sonata composition form of music [consisting of exposition, development, and recapitulation]. 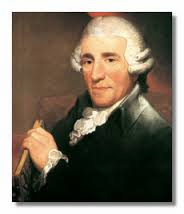 Franz Joseph Haydn was warmly known as 'Papa' Haydn. The people of the time loved Haydn and they loved his great symphonies They loved his symphonies because it was not just great music, it also had Haydn's playfulness and musical 'joke' he would put in his symphonies. People looked forward to hearing that one moment or phrase that would bring a smile to their face. Haydn never disappointed. Because Haydn composed so many symphonies, it was hard to remember each by their number. So, many of the symphonies were given names, not by Haydn but by the critics and concert going public. You have the Clock Symphony, the Military Symphony, the Surprise Symphony, etc. The story behind the name of his symphony #96, "The Miracle Symphony" is legend. As I told you the people of the time loved their Papa Haydn. In the premiere of this symphony with Haydn as the conductor, as it was coming to a close, the people in the back came close to the stage to get a good view of their Papa Haydn, and give him a great ovation. As the story is told, with the people crowded close to the stage, a giant chandelier near the back of the symphony hall came crashing down into the seats that were recently vacated. Thus, the miracle. Historians say this did happen, although it may have been in his 102nd symphony. But whatever symphony it happened in, Franz Joseph Haydn was indeed the miracle man. Here is the fourth [final movement] of the Miracle Symphony which has a fun, playful nature which is characteristic of a Haydn symphony. I think you will see why Franz Joseph Haydn is one of my favorite composers. Please turn up the volume and enjoy Haydn's "miracle". Tales Bonus Haydn: Also, turn up the volume and enjoy two more Haydn pieces that are two of my favorites. His Trumpet concerto in E-Flat Major and his Piano Concerto in D major [the energetic first movement, vivace]. The Trumpet Concerto has 3 movements: 1. Allegro (29-6:35); 2. Andante [a very pleasant serene movement from (6:51-10:34)]; and the exciting well known 3. Allegro in rondo form (10:43-15:07). Fascinating fun account- thanks for sharing --- darn good music also! Yes, Haydn is terrific! I will look on iTunes for more. I have Variations on a Theme by Haydn conducted by Maestro Maazel on my iPod. Thanks! Wow, thats great Joel....One of my favorite pieces and one of my favorite conductors! Thanks Joel! This is so beautiful. I love your explanation too. Thanks for the nice article. The real Haydn fan needs to go to Fertod, Hungary, because that is where the Esterhazy's had their "hunting palace" appropriately named Esterhaza. There, you can see the room where this delightful symphony was first performed. It is a surprisingly small room. Wow! Thanks for that information David!